Ms Chee Siok Chin began serving her one-week jail sentence yesterday after District Judge Chng Lye Beng had found her guilty together with Mr Gandhi Ambalam and Dr Chee Soon Juan for distributing flyers without a permit. The Deputy Public Prosecutor had during the hearing emphasized that it was not the distribution of the flyers per se that was illegal but the content of the flyer which was critical of the policies of the Government was also illegal. The police witnesses had testified during the trial that distibuting flyers was a common and normal activity. They could not say what offence the Defendants had committed. 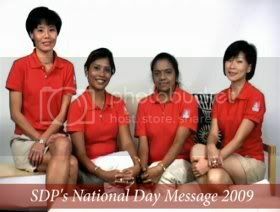 One even said that in his opinion, the SDP leaders were not committing an offence. Furthermore, the licensing officer testified that distributing flyers for a commercial cause did not require a permit whereas one was needed if the cause was political. This, of course, is not true because the law (Miscellaneous Offences Act) does not make such a provision. The Defendants also argued that the fact that the flyer criticised the Government was irrelevant to the charge. The three have appealed the conviction. Ms Chee has chosen to serve her sentence first but will continue with her appeal because it is important that the High Court renders its decision and grounds if it upholds the conviction. Even as she begins serving her sentence, Ms Chee will be brought to court daily for the on-going hearing before District Judge Toh Yung Cheong for a separate charge for “attempting to take part in a procession” during the WB-IMF meeting in 2006.